Every Monday I volunteer with a program at the local elementary school, reading with kindergartners in need of additional literacy and/or mentoring time. I mostly do it for fun and to give back, and I would recommend it for those reasons alone, but if you happen to be a picture or children’s book writer I HIGHLY recommend finding a similar program. Even as someone who doesn't plan to write for this age group, it's fascinating to see what grabs beginning readers, what bores them, what helps them learn, what they think is absolutely positively cannot-stop-laughing hilarious. 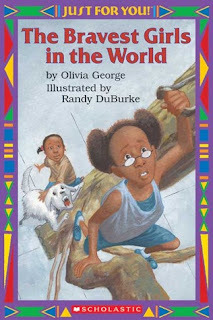 The Bravest Girls in the World is the story of Toshi, who adjusts to life in a new part of the city and overcomes her paralyzing fear of dogs with the help of her new friend Meeka and her dog Sugar; and in turn, Toshi helps Meeka overcome a fear of her own. The book is part of the Just for You! series, which is specifically aimed at an underrepresented minority audience. I love the idea that an African American girl living in a city apartment could pick up this book and immediately see herself in the characters more easily than she might with the usual children's book fare. But you know which one of my students today picked out this story, really enjoyed listening to it, and chose it for the one book they’re allowed to take home each month? A white boy from the Oregon suburbs. He didn’t reject it as a “girl book” or get thrown off by any of the other ways the characters and setting were different. He just liked the story about dogs and tree climbing and overcoming fears. He connected to the characters and their emotions. And at the part where Toshi is trying to motivate Meeka to overcome her fear, my student chimed in, “Yeah, and she should tell her that you can do anything you want when you put your mind to it.” I wanted to hug him and whatever parent/teacher/book/movie planted those positive thoughts. When we reached the end of the book, he asked if the two photographs were of the mom and dad in the family, and I explained that they were actually the author and illustrator. This shows it’s possible to write what might be seen as a niche book (in this case an important niche, I think) and still connect with a broader audience if your narrative and characters are strong. And you also shouldn’t underestimate the potential open-mindedness of your readers, especially young ones. Much as I try to fight against gender stereotypes, I never would have expected him to like a book with “girls” in the title, to be honest, especially since he usually chooses photo-dominated books about race cars, ninjas, or spiders. I’m very glad he proved me wrong. I had that thought, too :-). They don't seem to have much of an online presence though, so I didn't have any luck yet. Let me know if you find something!